Get Blender 2.79 at https://www.blender.org/download/ and install it. Download The Grove’s package and unzip it. Inside you will find TheGroveAddon.zip – keep this second zip file zipped to correctly install it in Blender. 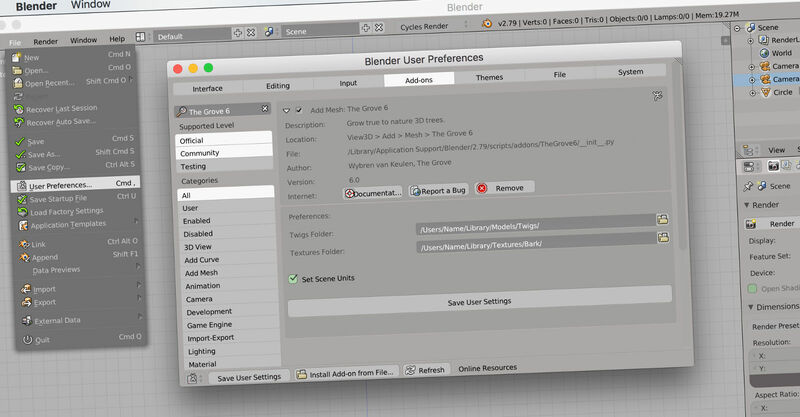 Launch Blender and open up your User Preferences from the File menu. Switch to the Add-ons tab. Click Install from File… Browse to TheGroveAddon.zip, select it and hit enter to install. Scroll down the list of add-ons to find The Grove. Check the small checkbox to enable the add-on. Click the little triangle to reveal more information and settings. Let The Grove know where to find your twigs and textures. You can download twigs and textures anywhere you like, and then point The Grove to your these folders. Click Save User Settings to keep The Grove enabled next time you start Blender. Close the User Preferences window. From the menu in the bottom of the 3D view, select Add > Mesh > The Grove. Not much will have happened until you open up the tool shelf from the View menu (or simply press t to toggle it). The tool shelf will open to the left of the 3D view and most of it is occupied by the tool shelf tabs. At the bottom you will find the current tool options titled “The Grove”. If not, there’s a small + icon at the very bottom. Click it and drag the divider up over the tool tabs to get some more space. Make the tool shelf a bit wider by dragging the border with the 3D view to the right. When the add-on shows up, your installation was successful. Be sure to back up your downloaded copy of The Grove add-on for the future. After installing an update of Blender, it might be necessary to repeat the above steps. If all went well, start growing with the Quick Start guide. If you have trouble installing, please let me know. The Grove’s bark materials and twigs are created for the Cycles render engine. You may want to change Blender’s default renderer to Cycles, using the drop down menu in the top of the screen, left of the Blender logo. This selection can also be saved to your startup file. The default Blender interface theme is very dark. Tree branches are also dark, which makes your tree hard to see in the viewport. I recommend a bright theme like Blender 24Xfor the best experience.